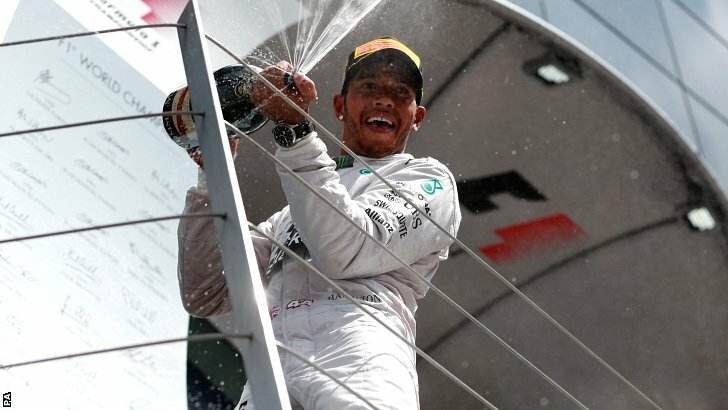 Home » Formula One: Hamilton hammers his way to home win as Rosberg retires! Lewis Hamilton has won his home race, the 2014 British Grand Prix, in a dramatic race that saw an lap 1 red flag and a retirement for championship leader Nico Rosberg. Rosberg had been leading, but was being caught by Lewis. A battle was being set up between the pair, but was never seen after a gearbox problem struck Nico’s car and forced him to retire for the first time this year. Valtteri Bottas inherited a career best 2nd place after getting his first podium at the last round in Austria, with Daniel Ricciardo holding on to 3rd after a late chance for McLaren’s Jenson Button. Nico Rosberg was on pole position after Hamilton’s mistake in qualifying. Lewis got a fantastic start as he tried to make amends. He passed the slow starting Hulkenberg and Vettel and was 4th by the time they reached the wellington straight. Jenson Button had also gotten a great start and moved up to 2nd ahead of his fast starting team-mate Kevin Magnussen in 3rd. The race had hardly begun when drama ensued. Vergne got into the back of Perez in turn 2 which put the Mexican into a spin. Then, as the two Ferrari’s tried to make their way forward after a poor qualifying, Raikkonen went off into the run off area and tried to rejoin over the grass. His Ferrari jumped over a rain gutter which pitched the Finn into a high speed spin into the barriers surrounding the bridge. A heavy impact followed which sent the Ferrari back across the track. Felipe Massa had stalled on the grid and was slip-streaming Kamui Kobayashi when they reached the accident scene. Both took avoiding action, with Massa clipping Kimi’s car. The Iceman gingerly stepped out of his stricken car and, with help from the Marshalls, made his way to the medical centre. Reports suggest he has a bruised knee and ankle with no serious injury. The red flag came out shortly afterwards to clear the mass of debris on the straight and to repair the barrier that Kimi struck. An hour wait followed before the race was restarted under the safety car. Rosberg got a great getaway as they came down the Hanger straight. Hamilton held 4th place for half a lap until the he reached the old start/finish straight. Lewis got slightly alongside Magnussen’s McLaren, but it looked like the move wasn’t going to stick. However, Kevin went into Copse a little too hot and ran wide, gifting Lewis 3rd place. 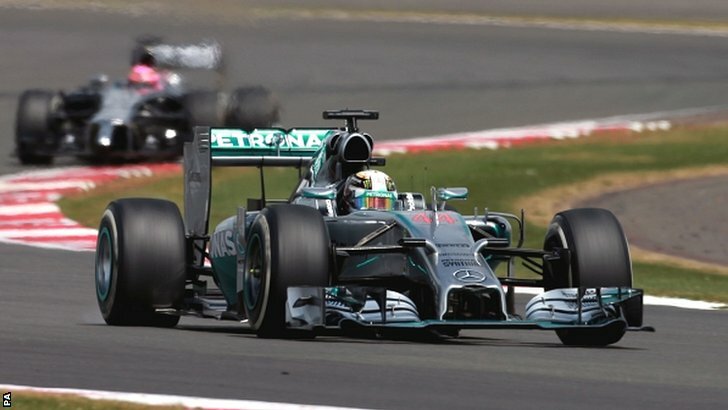 Hamilton then chased down former team-mate Jenson Button and made short work of him into Brooklands on the next lap. By then, Rosberg had pulled out a 5 second lead and it was up to Hamilton to chase him down. Qualifying had seen the two Ferrari and Williams cars eliminated in Q1 after a dramatic session. After the first lap crash, 1 car from both teams had been eliminated, leaving it to Alonso and Bottas to fight their way to the front. Both Bottas and Alonso had chosen to switch tyres under the red flags, meaning that they could stick on the better tyre compound throughout the race. Bottas passed Hulkenburg for 6th place after gaining many positions on the original race start. Alonso then started to make gains after undercutting Kvyat at Luffield. Next up was Ricciardo who was trying to pass Hulkenburg at Vale. The attempted overtake left the Australian vulnerable to attack from Alonso, who took the place around the outside to get on the back of Hulkenburg. The Spaniard was then given a 5 second penalty after it was discovered that he had started the race out of his grid slot, but he still overtook the Force India at Brooklands irregardless of the small setback. Vale proved to be a prime overtaking point for the race, with Pastor Maldonado trying to pass Bianchi’s Marussia there. 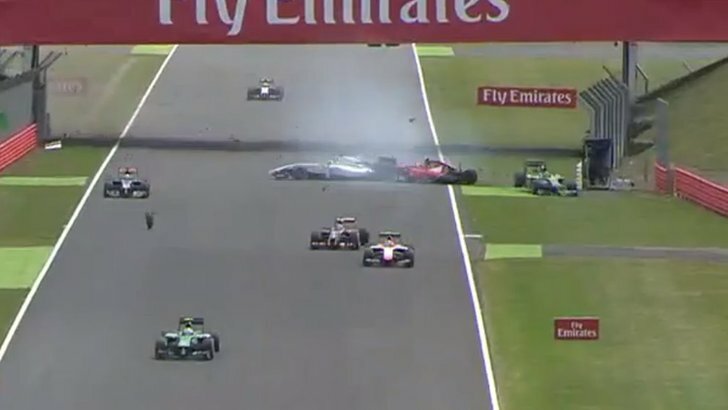 Esteban Gutierrez was trying to take Maldonado at the same time, with the Mexican clipping the rear of the Lotus, almost rolling the Venezuelan. 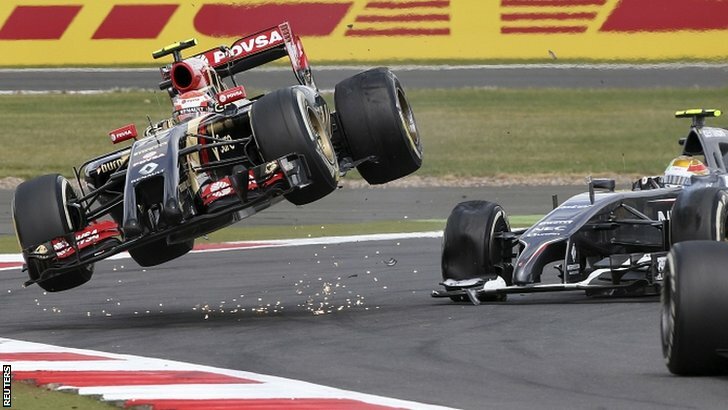 The incident was very similar to the turn 1 contact at Bahrain where Pastor had rolled Esteban. The contact caused problems for Gutierrez’s Sauber, which lost all turning ability into turn 2. The Sauber became beached in the gravel trap which bought out the yellow flags. Sebastian Vettel pitted from 5th, seemingly in anticipation of a safety car that would fail to emerge. The overtaking frenzy seemed to switch from Vale to Stowe, with Bottas passing Magnussen around the outside, Alonso getting him on the inside on the next lap, with Vettel taking Hulkenberg there a few seconds later. Bottas then passed Kevin’s team-mate Button there a few laps later. Back up at the front, Hamilton was beginning to eat into his team-mates lead, with Nico choosing to pit on lap 19. Lewis was given the call to push as hard as he could, with the fastest lap soon falling his way. Lewis then chose to lengthen his stint to try and limit the amount of time he’d have to spend on the slower tyre. Nico started to shave off tenth after tenth, with Lewis then pitting on lap 25. Once again the Mercedes team seemed to struggle with Hamilton’s service, with the Briton’s stop 1.4 seconds slower than Nico’s. Things seemed to be gearing up for a titanic battle between the two Silver Arrows, with Hamilton preparing to try and reel him in when he pitted later on for a final time. Before that however, he’d have to endure a short stint on the tyres that were supposed to be half a second slower than the options that Nico had on his car. However, this was not this case. Hamilton somehow managed to find a massive amount of pace in his new tyres and started taking chunks out of Nico’s lead. In just a few laps the lead went from over 5 seconds to just over 2. Lewis was closing in rapidly on Nico Rosberg when the German’s race came crashing down. He had reported a small downshift problem earlier on and as he lapped a Marussia into Village, his gearbox gave out completely. 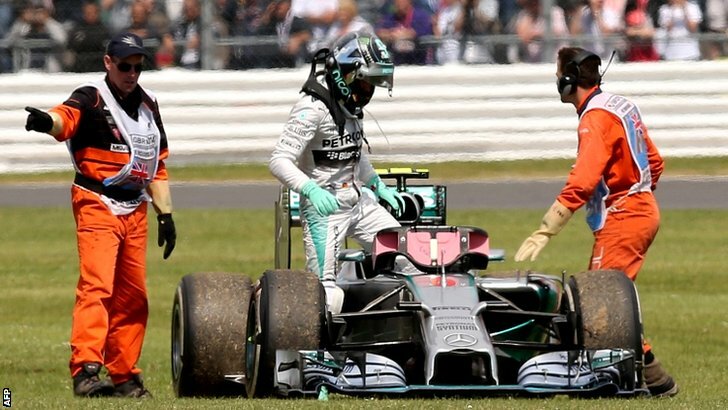 His car was stuck in 5th gear as Lewis blasted past, with Nico trying desperately to fix it. He cruised around to the Maggots-Becketts section where he finally bought his car to a stop. A few more minutes of desperate solution searching followed before he finally stepped out of the car and into retirement for the first time since last year’s Chinese Grand Prix. From then on in, it was all about cruising home for Lewis Hamilton, the moment he took the lead he started being more cautious. If he were to win the race, he would close Rosberg’s 29 point championship lead to just 4 points. Whilst Hamilton was starting to cruise, Alonso and Vettel were just getting started. The pair had been massive rivals over the last few seasons and the rivalry was far from over in Northampton. Alonso pulled off a daring move around the outside of Copse on the world champion after the Red Bull had emerged just ahead of him after a pit-stop. The German had tyres that were around 10 laps fresher than the Spaniards, which the reigning champion soon put to good use. He was soon back on the gearbox of Fernando as he tried to retake 5th place around the outside of Brooklands. Alonso held on at the inside, before sweeping across the front of Sebastian to keep the place. Sebastian soon got on the radio to complain that they would have crashed if he hadn’t braked, with Alonso complaining on the next lap that Vettel was going off track. The battle continued for almost 10 laps with neither driver relenting to the other. Vettel got close again on the run to Copse with 9 laps to go, but Alonso kept the door bolted shut. The complaints were flying back and forth like a tennis ball at Wimbledon. Vettel tried around the outside of Brooklands, but Alonso hung on once again. The pair continued to go wheel-to-wheel through the kink at Woodcote and on the run to Copse, with Vettel throwing the car down the inside to finally break free from Fernando. However, the champion had lost so much time while trying to pass Fernando that any hopes of grabbing 4th were gone. After gaining the lead at the halfway point, Hamilton was left alone to cruise home in his Mercedes. He had a 42 second lead over Valtteri Bottas with 10 laps to go and commented that his tyres still had a lot of life left in them. Nevertheless, the Briton made a final precautionary pit-stop which went perfectly. He re-emerged with a 21 second lead and just eased the car round the final few laps. As he rounded the long right hand corner of club for the final time, he was already waving to the crowds. The grandstands erupted as Hamilton crossed the line to take the victory in his home Grand Prix exactly 4 years after his first time. Valtteri Bottas claimed his first podium finish of his F1 career in the Austrian Grand Prix after a fantastic 3rd place. The Williams driver had suffered an awful qualifying yesterday, but after a superb opening stint of the race saw him go from 17th to 3rd, he went on to go one better than his Austrian race result by claiming 2nd place. Daniel Ricciardo took the 4th podium of his career after holding back a late charge by Briton’s Jenson Button. The McLaren driver gave it absolutely everything to try and take a dream podium finish in a Grand Prix where he was racing for his father who passed away earlier this year, but it was not to be. The gap between himself and Ricciardo in 3rd was just over a second. Sebastian Vettel took 5th place after his long-fought battle with Fernando Alonso. The pair remained critical of each-other after the race, but both shared the opinion that it was a great fight. Kevin Magnussen and Nico Hulkenberg seemed to lack the pace to stay with the front runners as the pair settled for 7th and 8th, with the two Toro Rosso’s taking the final 2 positions in the top 10 to earn 3 points for the Italian team. Sergio Perez recovered from his spin at the start of the race to finish just outside of the top 10 ahead of Romain Grosjean’s Lotus. Adrian Sutil got 13th after complaining that he couldn’t be expected to race with the awful brakes on his Sauber. Jules Bianchi finished 14th after starting from 12th, with Kamui Kobayashi holding off Max Chilton for 15th. Pastor Maldonado was classified as the 17th placed finisher after a late retirement in the final 2 laps. Nico Rosberg was the first non-finisher after his first retirement of the year, with Marcus Ericsson also not finishing for the 4th time this year. Esteban Gutierrez was next after his contact with Maldonado left him in the gravel and in 20th, with lap 1 retirees Felipe Massa and Kimi Raikkonen propping up the back of the field.